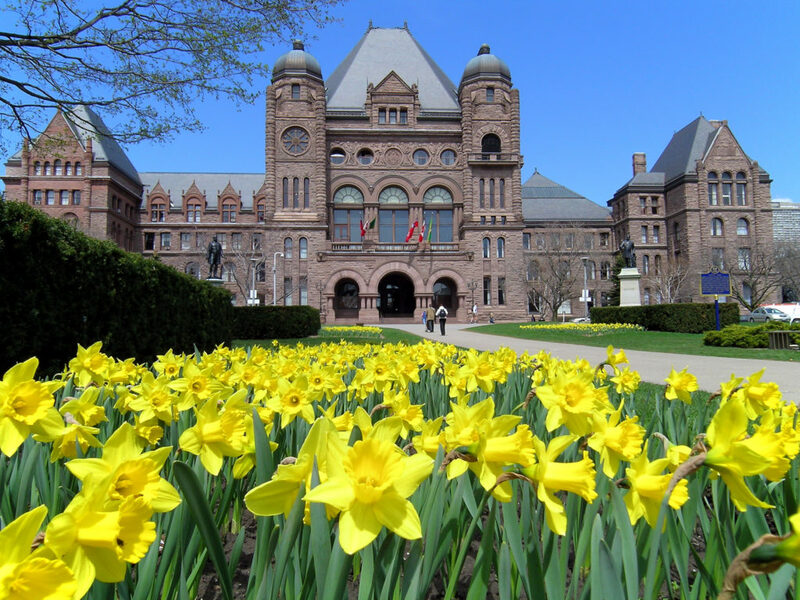 Back in March, the Ontario Liberals put all of their chips on the table with their election-style provincial budget. They promised free child care, more support for dental care and drugs, and a reinvestment in health care—bankrolling it by deficit spending for the next six years. That left the opposition parties with two options: they could call the Liberals on a bluff or they could raise the stakes. New PC Leader Doug Ford is raising the stakes by tearing up his predecessor’s comprehensive, fully costed platform and promising five planks—as yet not revealed to the public. Green Party Leader Mike Schreiner, whose party does not have a seat in the provincial legislature, has thrown all of his chips in the game, too: promoting a broad-ranging platform that includes measures to reduce economic inequality and to address climate change. Last move, NDP Leader Andrea Horwath. Today, she showed her hand by releasing a fully costed platform (with the Kevin Page seal of costing approval) that goes big on health care spending, promises $12 a day child care (free for households making less than $40,000), a commitment to build 65,000 more affordable homes, and a much needed raise in social assistance rates. This increased commitment to public services means an additional $5.4 billion going to essential public services in 2018-19, rising to $15.8 billion in 2022-23. The NDP have a plan to raise taxes on businesses and the wealthy to pay for these promises—and that plan includes smaller deficits than the Liberals’. It seems they have upped the stakes in this dramatic pre-election period. We read the 100-page platform document so you don’t have to, but you can review it for yourself on their website. Here, we break down some of the planks of the NDP platform. Health care investment: By focusing on eliminating “hallway medicine”, the NDP is raising the stakes by promising to increase hospital spending by 5.3 per cent for the next four years, and to top that up with an additional $312 to $364 million per year for new beds. The Liberal platform includes a 4.6 per cent increase for next year. Child care improvements: How can you trump a Liberal promise to let kids aged 2.5 to 4 go to child care for free? The NDP is promising $12 a day child care for everyone, offering free coverage for households earning less than $40,000. It also commits to expanding the number of not-for-profit, licensed, affordable child care spaces by 202,000 spaces. The Liberals have promised 14,000 new spaces over the next six years. Affordable housing expansion: The NDP is promising to fund the province’s one-third share of repairing social housing, to build 65,000 new affordable homes over the next decade, and to invest $3 million to seed co-op bid development. Universal pharmacare and dental care: As we’ve written elsewhere, the NDP had already announced universal free pharmacare by 2020 and dental care for everyone. It would also expand public dental services with $25 million in capital investments. Long-term and home care: The NDP has committed to building 15,000 more long-term care beds over the next five years, rising to 40,000 new beds by 2028. It would increase home care funding by $300 million to eliminate wait lists, increase service hours, and offer more respite care for family caregivers. Public education: The Canadian Centre for Policy Alternatives has long been calling on the province to fix its flawed education funding formula. The NDP promises to re-write that formula, hire more teachers and educational assistants, cap kindergarten classroom sizes at 26 students, invest $16 billion to repair crumbling schools, and put an end to EQAO testing. Post-secondary education: Already announced, the NDP promises that every student who qualifies for OSAP will get a non-repayable grant instead of a loan and it will wipe out student loan interest owed or paid to the province for anyone who still is repaying a provincial student loan. It will also implement a “faculty renewal strategy” to convert contractors to full-time professors. Public transit: The NDP is promising to cover 50 per cent of operating costs for municipal transit. It’s also addressing some regional transit issues: there would be two-way all-day GO rail service between Kitchener-Waterloo and Toronto; year-round GO rail service between Niagara and Toronto; restoration of Ontario Northlander’s passenger service and supports to the Huron Central and Algoma Central Rail Lines; it would build Toronto’s downtown relief line right away and it would do the same for Hamilton’s LRT plans. Return hydro into public hands: The NDP is the only party going into this election with a commitment to buy back Hydro One shares so the government can return hydro into public hands. Boost incomes for low-wage workers: If elected, the NDP would stick with the Liberal plan to raise the minimum wage to $15 an hour on January 1, 2019. Raise social assistance rates: Successive Liberal governments have moved away from the harsh political anti-poor tone and policies that defined the Harris era, and softened the rough edges with welcomed regulatory tweaks. They have also implemented incremental increases in social assistance incomes. But those increases haven’t even kept up with inflation, nor have they made up for the dramatic 21.6 per cent cut in the 1990s. Over the next three years, the NDP would raise social assistance rates by 22 per cent for Ontario Works (OW) clients and by 15 per cent for Ontario Disability Support Program (ODSP) clients, as recommended by the Provincial Income Security Reform Working Groups. The Liberals, in turn, are promising to increase rates for by 9 per cent over the next three years. Jobs: Among the highlights, the NDP is promising workers the right to card-based union certification and first-contract arbitration; it would expand Community Benefit Agreements, making them integral to all infrastructure projects; it would implement a plan for auto and manufacturing jobs; it would invest $57 million from the Jobs and Prosperity Fund to create new opportunities in the trades; it would also create opportunities for mid-career education, offering training for people who are working and those who are between jobs. Turning to the wealthy to contribute more: The NDP would make Ontario’s income tax system more progressive by raising the marginal income tax by one percentage point for those earning over $220,000 and by two percentage points for those earning more than $300,000. This would raise an estimated $606 million in the first year. It would tax luxury cars—those going for $90,000 and up, raising $12 million annually. And it would mirror the B.C. home speculation tax for investors who don’t live in Ontario, raising $671 million annually. Turning to businesses to contribute more: The NDP would raise the corporate income tax by one percentage point in 2020 and by another half a percentage point in 2022. That would result in a 13 per cent corporate income tax rate, keeping Ontario competitive with jurisdictions in the U.S. and Canada. It would raise an additional $1 billion by 2022-23 by increasing the education property tax rate on businesses, a recommendation from the Drummond report in 2012. It would also reduce the threshold for Employer Health Tax exemption from companies with $5 million or more annual payroll down to $1.5 million. It also tells you something about the shifting political landscape in Ontario: just one provincial election ago, no political party was forthright enough to go into an election saying Ontario needs to substantively raise new sources of revenue to pay for the things we need. The NDP is breaking new ground by implementing a suite of taxes that are progressive and substantial enough to cut the Liberals’ projected deficit in half in 2018-2019 and below the Liberal projected deficits for the next three years landing on a $1.9 billion deficit in 2022-23. These new revenue sources would also enable the government to maintain and expand services as well as stop the flow of privatization schemes that have become the norm since the mid-1990s. Why do taxes matter? Ontario has a revenue problem—the direct result of tax cut politics that led to a form of perma-austerity, where program spending failed to keep up with population growth, inflation, and the growing needs of an aging boomer generation. It also allowed public infrastructure to deteriorate. For years, the Canadian Centre for Policy Alternatives has highlighted the need for Ontario to address its revenue challenge. Several years ago, Alex and Jordan Himelfarb co-edited a book entitled Tax Is Not A Four Letter Word. It was a clarion call to governments who say they want to be activist, who say they want to reduce income inequality and improve public services. It was a basic reminder that previous generations of Canadians expanded the social safety net and built the physical infrastructure we rely on to this day through the collective action of paying our taxes once a year. For the common good. In their report, Canada’s Quiet Bargain, Hugh Mackenzie and Richard Shillington showed that middle-income Canadian families enjoy public services worth about $41,000—or 62 per cent—of their income. Even households earning $80,000 to $90,000 enjoy public services benefits equivalent to about half of their income. That’s why they call taxes Canada’s quiet bargain. Going into an election with clear-eyed measures to raise the revenue needed to pay for platform promises shouldn’t be seen as a bold gamble; it should be viewed as the responsible thing to do. On the tax front, the NDP has differentiated itself from its competitors. Authors’ Note: We are monitoring major proposals from all of the parties in the lead up to the June 7 election, analyzing their implications on income inequality, decent work, public services, climate change, and ensuring a just transition that works for all. Trish Hennessy is director of the Canadian Centre for Policy Alternatives’ (CCPA) Ontario office. Sheila Block is a senior economist and Ricardo Tranjan is a senior researcher both with the CCPA-Ontario.